Here is a comparison of this platinum proof striking (left) with the authorized issue in gold (right). This is the only known Canadian $100 platinum striking of any design or series. This is one of the most spectacular coins ever released by the Royal Canadian Mint. It is certified by PCGS as an "Unofficial Platinum Strike Uniface." Lab analysis determined that the metal composition is 90% platinum and 10% rhodium and weighs 16.73 grams. In 1985, the Royal Canadian Mint experimented with platinum coins and began issuing them in 1988. 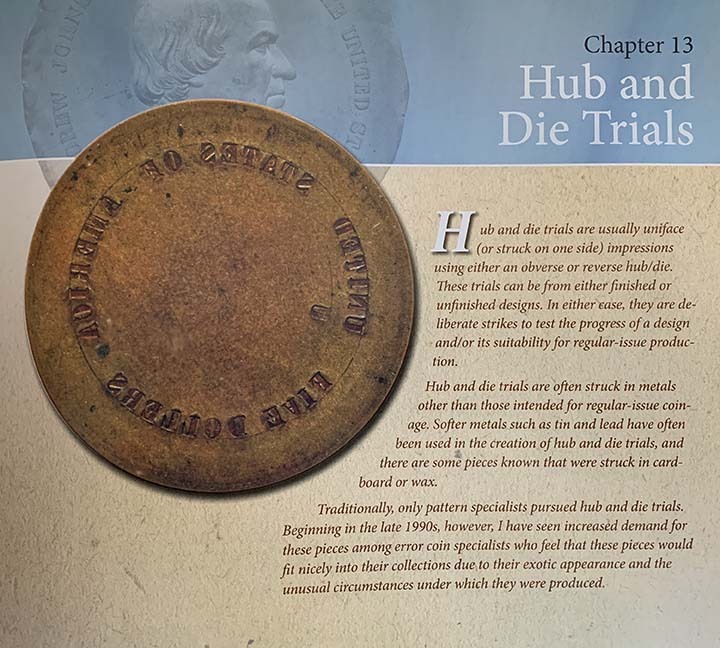 This is the only known platinum mint error or pattern/die trial. 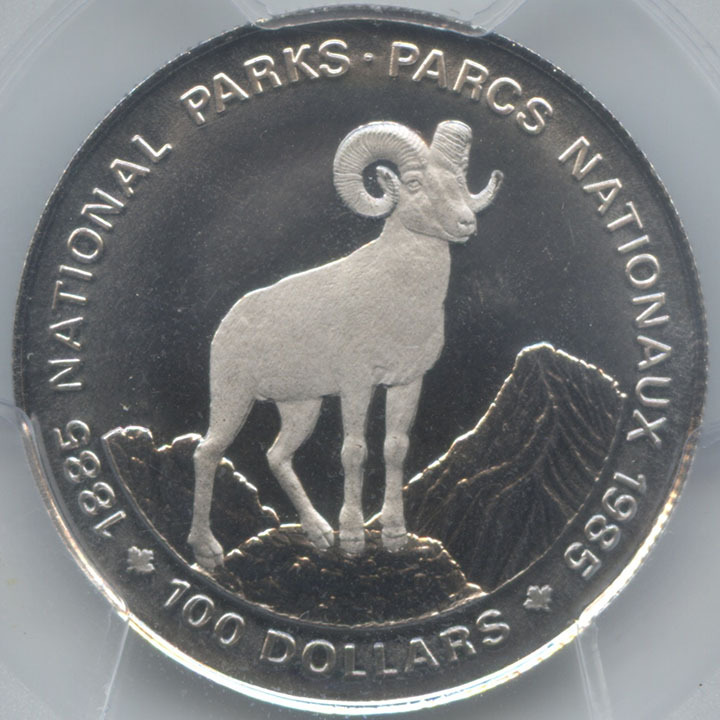 The Royal Canadian Mint issued the $100 National Park Commemorative Coin in 1985. This coin was issued in gold for one year only in 1985. 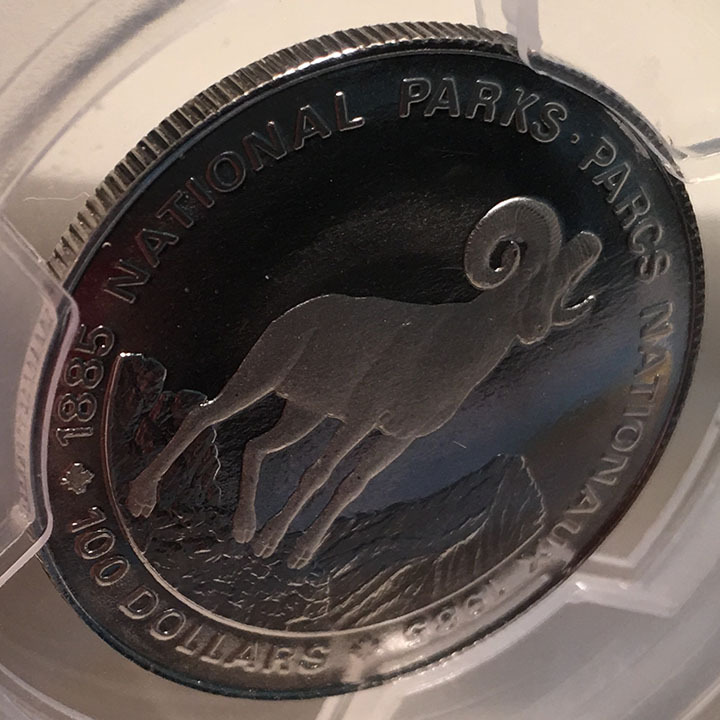 The obverse depicts Queen Elizabeth II and the reverse has a Bighorn mountain sheep. Starting in 1988, the Royal Canadian Mint produced platinum coins that were made of .9995 pure platinum in four denominations of different sizes, consisting of 1 troy ounce (oz), 1⁄2 oz, 1⁄4 oz, and 1⁄10 oz. bearing the face values of $50, $20, $10, and $5, respectively. Since then they have also struck platinum coins with various designs in $8 and $300 denominations. 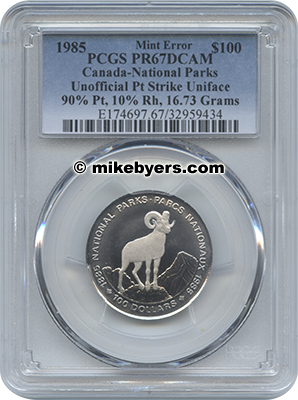 The Royal Canadian Mint did not strike any $100 denomination coins in platinum of any design or series. 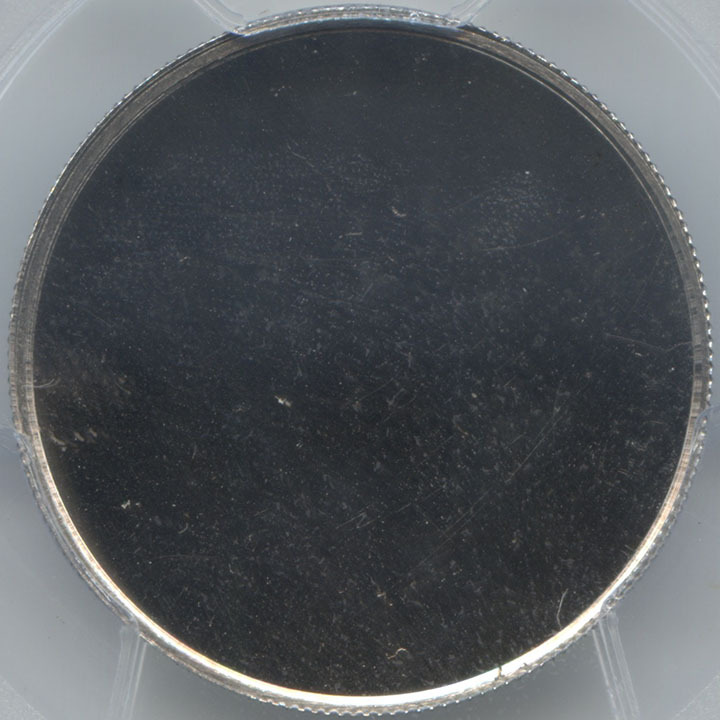 It is incredible that this dramatic and unique platinum striking was discovered and subsequently sent to PCGS for authentication and grading. This proof Canadian $100 Commemorative Coin struck in platinum combines several major mint errors. It is an off-metal (not struck in gold) and is also uniface. Whether it is a mint error or a pattern/die trial only adds mystique to this world-class proof platinum uniface striking. 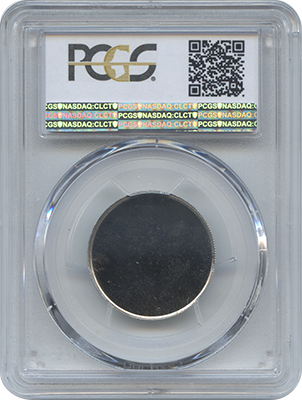 It is in gem proof condition and is on a perfectly centered full size planchet with full reeding, specifically produced to strike this platinum proof uniface coin. 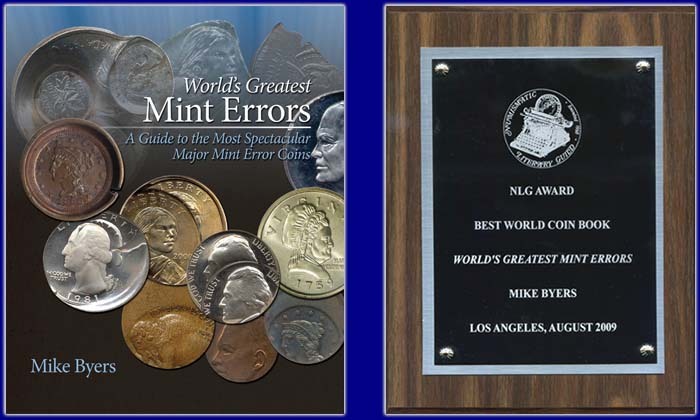 This unique proof platinum striking rivals any U.S. Major Mint Error, Pattern or Die Trial in rarity, prestige and value.